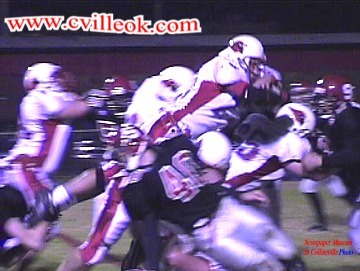 The Collinsville Cardinals refused to quit ... but were unable to stop Skiatooks's big plays. Skiatook's #20 (Andrew Tomlinson) reached the endzone on this play from the Cardinal's 24 yard line at 9:38 in the second quarter, but it was called back to the 30 on a penalty. This left Collinsville leading 6-0 at the time. A few plays later Skiatook went on a 4th and 8 and was successful with a TD pass to gain the lead. Zeb Yeager dives in from the 1/2 yard line to give the Collinsville Cardinals a 6-0 lead at 6:41 in the first quarter. Collinsville started after the opening kickoff at their own 28 and moved down the field in twelve plays to score on their first possession. There were only two pass plays in Collinsville's opening drive. The play to the right was the first play of that drive and QB Tyler Whitaker barely gets the pass off. Skiatook interferred on that play and the Cards moved to their 43 yard line. 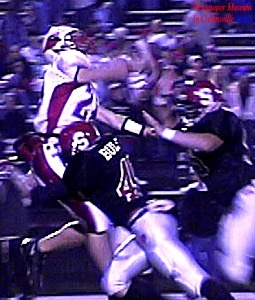 On the pass above, Whitaker has more protection and the pass was complete to Ricky Rimpley to Skiatook's 37 yard line. Justin Scott (#31 on the ground) rushed for a 20 yard gain to the Skiatook 20 in the first Collinsville drive.